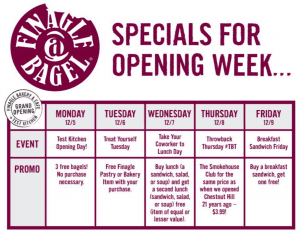 Finagle a Bagel is opening a Bakery, Café, & Test Kitchen at 77 Rowe Street in Auburndale/Newton on Monday, December 5, 2016 and are hosting specials every day for Opening Week! Thursday, 12/8: Throwback Thursday #TBT – Get the Smokehouse Club for the same price as when we opened Chestnut Hill 21 years ago at $3.99! For more information about Finagle Bakery, Café + Test Kitchen Grand Opening, please head here.